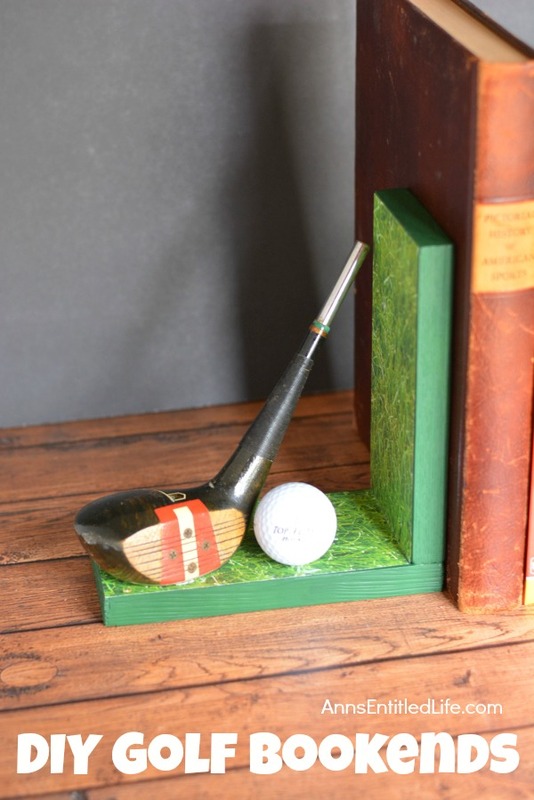 This fun and charming bookend project is a great craft for a golfer. 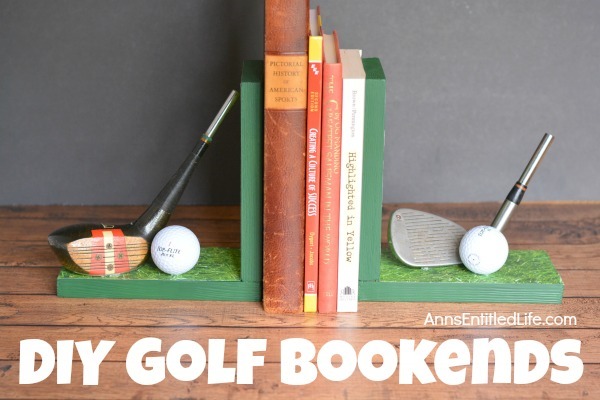 Whether you are making these delightful bookends to give away, or to add a touch of charm to adorn your own table top or bookshelf, these wonderful DIY Golf Bookends will add style and a sense of whimsy to any home decor. 1) Salvation Army, a garage sale, Goodwill… all GREAT places to find used gold clubs for a few dollars. You may want to consider a righty and lefty if you can find them so your golf clubs are facing outward on the bookend (in publishing, they call it flowing out to white space… or so I learned about 35 years ago). 2) Practice safety. If you don’t know how to use a hacksaw, get someone who does know how to use it to make the cut for you. 3) I am not responsible if you cut your hand off. I had to put that disclaimer in there. See #2 above. 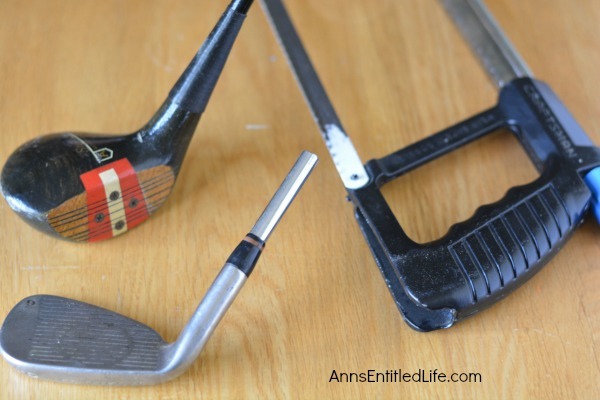 • Use a hacksaw to trim your golf clubs. • Hacksaws are inexpensive and come with the metal blade you will need to cut the golf clubs. • The golf clubs used in this project are trimmed to 2″ from the end. 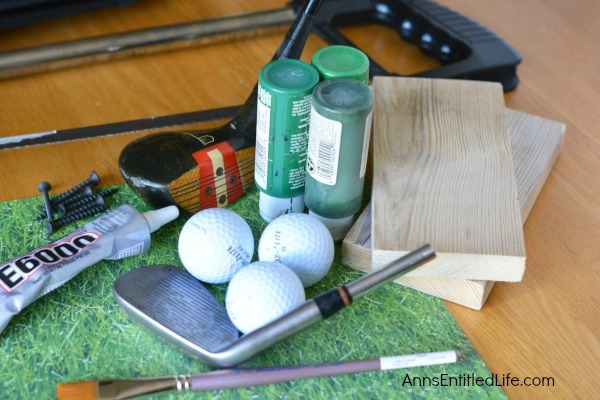 • Use a metal file to file down any rough metal edges that occurred when cutting the clubs. 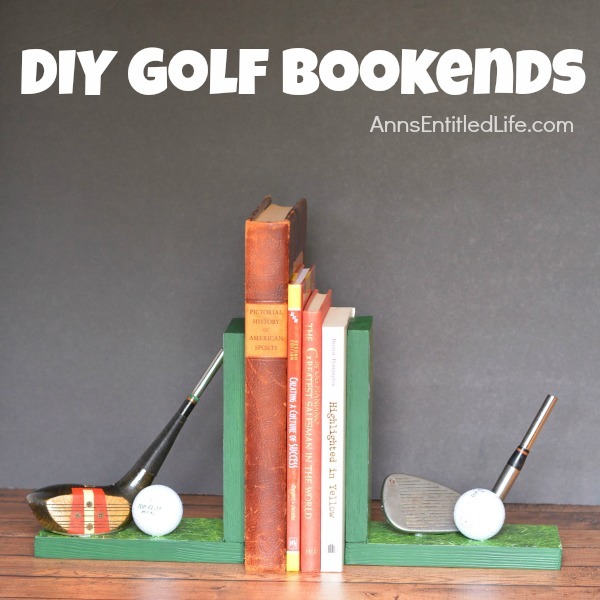 • Trim your boards to the length you desire for your bookends. • The length of the wood used in this project is 7″ long and 3.25″ wide (based on the length of the cut golf clubs). The thickness of the wood was 5/8″ thick. • Sand your wood with sandpaper where necessary. You want the wood to be smooth. Make sure you break the edges at the bottom of each cut piece of wood, and sand it smooth. 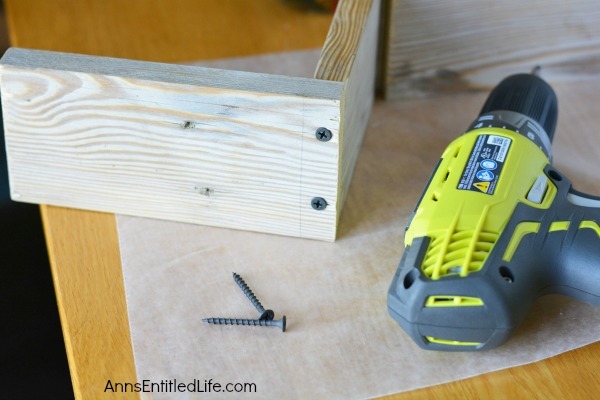 • Drill pilot holes into the corner of your bottom piece of wood. • Align your wood bottom flat to top bottom. • Screw in your screws. • You can draw a line to trace the board so that you can center your screw in that area. • A thin line of glue… whether Elmer’s or the E6000 placed down on the wood before screwing the wood together will also add strength. • Paint your bookends with green acrylic paint and a paint brush. • Mix two colors together for a different, unique look. This look was achieved by mixing Christmas Green Paint and Thicket Paint together. • Pay special attention to the sides of the wood. These will be exposed and not have a covering (the grass scrapbook paper or felt). • Make sure the screws are on the downside (the bottom) of you bookends. Be mindful of that when you paint and apply the paper in the next step. If you are adding felt to the bottom of your bookends, that will cover the screws and you won’t have to paint that section. 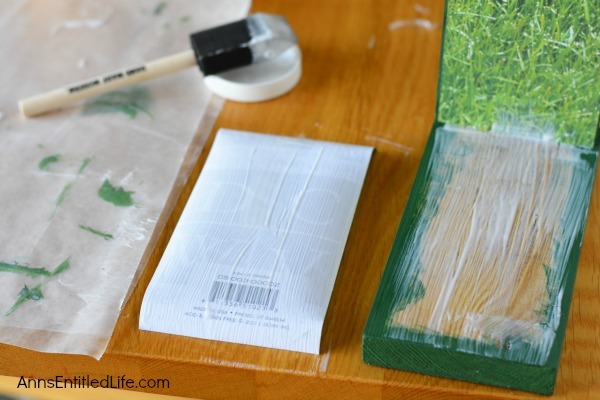 • You don’t have to paint the area you are covering with the scrapbook paper (or felt) if you do not want to, but make certain there is a slight overlap of paint so no raw wood shows through if you do indeed decide not to paint the entire piece. • Trim your scrapbook paper a little smaller than the actual size of the bookends. Use scissors or a paper trimmer. • Apply a thin coat of Mod Podge to the wood with your foam paint brush. • Apply a thin coat of Mod Podge to the scrapbook paper and place the onto the scrapbook paper onto the coated wood. Having both the wood and the scrapbook paper coated allows you to move the paper around a bit for better placement before the Mod Podge begins to dry. 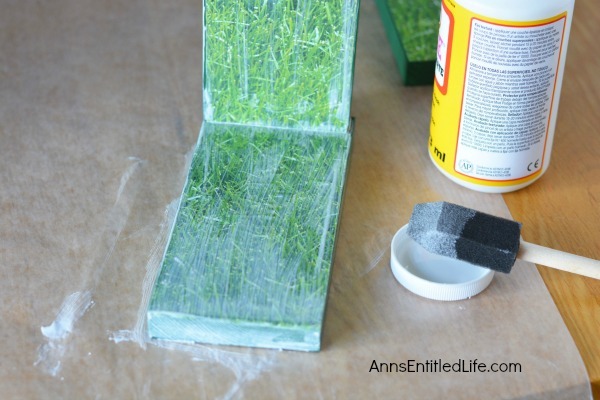 Use the palm of your hand and fingers to smooth out the air bubbles and excess Mod Podge. • Repeat on all four flat wood surfaces. Set aside to dry for about two hours. • Cover the wood and paper with Mod Podge. Let set to dry, about 1 hour. 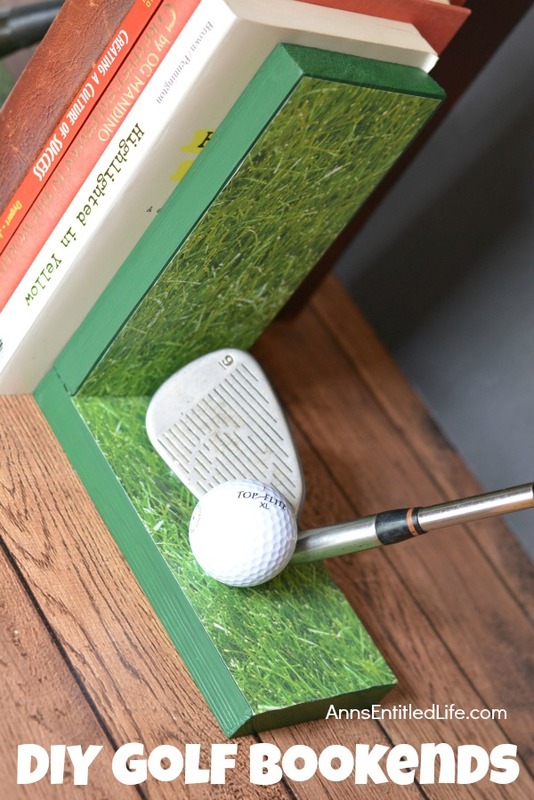 • Use your E6000® Craft Adhesive to affix the clubs and balls to the bookends at desired placement. These are probably not going to be centered. Try several positions before actually gluing, and always goes with what looks best to you! • You’ll want to find an undisturbed space to set your bookends when you are finished so the glue can set up and dry as directed on the package. These were left on a table out of reach for two days before using to hold books. • Optional: add green felt to the bottom of the bookends to protect the surface. Honestly, in my opinion this should never be an option; you should always attach felt so as not to scratch furniture or shelving. • This is the finished left side. • This is the finished right side. If you can find clubs that face the opposite way, it would flow better. Drivers, wedges, woods will add more impact then say, a putter. 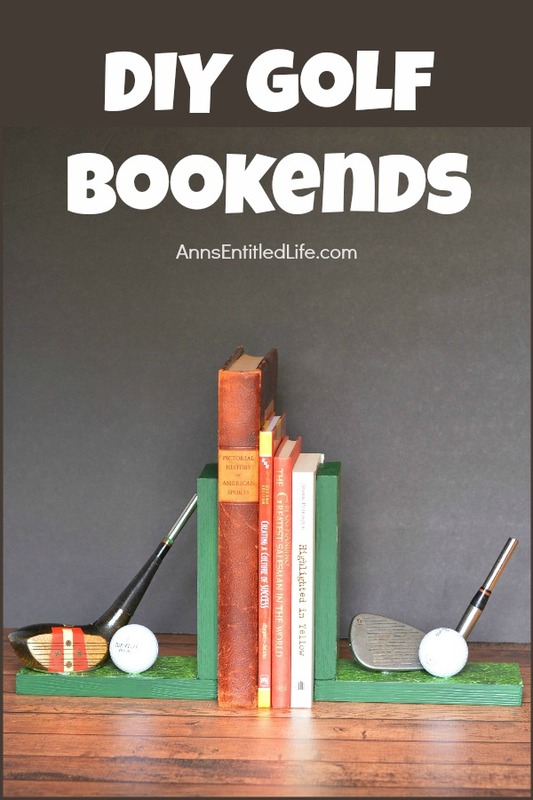 • To print the DIY Golf Bookends instructions, click here. That is so crafty!! If only I had the time!! Omgosh, these would be perfect for Father’s Day! Thank you so much for sharing your awesome idea with us at Merry Monday this week! SO clever! Love this great idea. I hope he likes it, Abigail! !